In honor of Thanksgiving I decided to do something special for YOU to thank you for being part of my community… that also gives back to those in need. If you dream of creating an amazing life and business where you maximize your impact, income and free time, I’ve put together something extraordinary for you… 11 of my best trainings, templates, outlines and more, valued at over $4,967, at a savings of 97%… WOW! If you’re serious about building a sustainable, thriving coaching business, you need to position yourself as an expert. An expert who has a proven system for getting results. When you want to boost your revenue quickly, an easy, high-ticket item you can sell is a “VIP Day”. In the Coach & Grow R.I.C.H. VIP Day Success Training, you’ll learn how to package and price your VIP Day, what to include, how to deliver great value without overwhelming your client, what you need to do differently in a live vs. virtual VIP Day and much, much more. Find out exactly what to do during your coaching consultations with potential clients using the 7-step Coach & Grow R.I.C.H. Client Enrollment Formula. The helpful template, timed outline and sample script make it easy to learn and implement this proven approach that has a lot more people say YES to coaching! In today’s world it’s critical to have a way to attract and connect with potential clients 24/7 via the internet. In this training you’ll discover the fundamentals of online marketing and lead generation so that you always have a steady stream of new clients. Originally presented as a half day workshop at an International Coach Federation Annual Conference, this engaging, inspiring and content rich training includes step-by-step guidelines, lively audience participation, helpful role plays, real-life case studies, specific examples and concrete action steps. If you’re ready to leverage your time, make more money and help more people – group coaching is the ticket! In this audio training Group Coaching Expert Michelle Schubnel reveals the 7 best group coaching models so you can determine the right one for you and your business. You’ll also find out the typical group duration, content, format, size, investment and the most effective marketing strategies for each of the group models. Did you know that there are 13 different factors you need to determine when designing a group coaching program? This fill-in-the-blanks template outlines each one so that you won’t miss any of the key areas as you design your irresistible coaching group. How you conduct the first session sets the tone for your entire group. This sample script and timed outline will enable you to powerfully and confidently start your group off strong, even if you’re brand new to coaching groups! A big key to being successful with groups is having the right tools, technology and systems so that you can easily handle all of the logistical and administrative details. The Resource and Technology Guide makes it easy for you to select the necessary tools and systems that you’ll use for your group programs, whether you’re on a shoe-string budget or you want to invest in the best. This “Done-For-You” Client-Attraction Teleseminar Package gives you EVERYTHING you need to offer and deliver a high-value “Best Year Ever” teleseminar proven to attract clients. Includes a step-by-step instructors guide, recorded trainings, ready-to-use marketing materials, 3 pre-written email campaigns and more! If you know you’re coaching is meant to make a difference in the world, and you want to figure out how to be well-compensated as you make a big impact while still having time to live your best life, the Lucrative & Leveraged Coaching Business Bundle gives you exactly what you need. 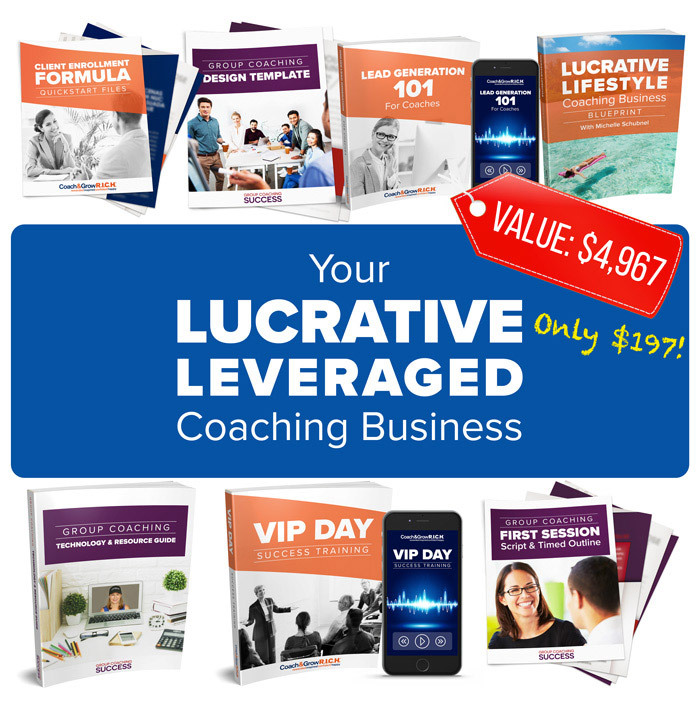 Get the Lucrative & Leveraged Coaching Business Bundle TODAY for ONLY $197.